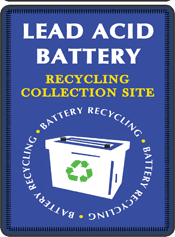 Recycle your lead acid batteries any time during the year! The District’s goal is to promote the lead acid battery locations (listed below) throughout the year. Residents can properly dispose of lead acid batteries at their convenience without having to wait for a specific time, limited to one week during the year. An additional change includes the payback received by local residents. Any payback will be at the discretion of the individual businesses. Look for the static cling sticker below to easily identify local businesses who are recycling lead acid batteries throughout the year.